Publisher: The Kelmscott Society. No date, circa 1900. 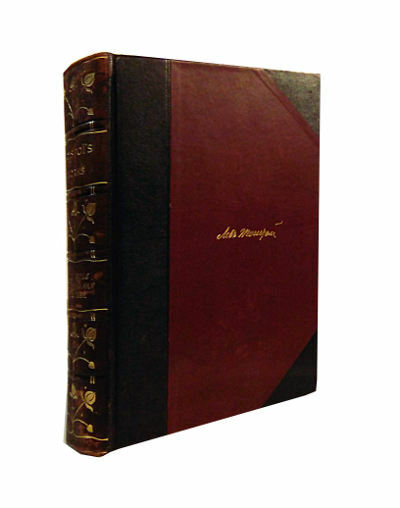 Condition: Half-leather, decorative spine. Very good. Slight rubbing. Text clean, binding tight. 455pp., app 7″ by 5″. The Kreutzer Sonata is a novella by Leo Tolstoy, named after Beethoven’s Kreutzer Sonata. 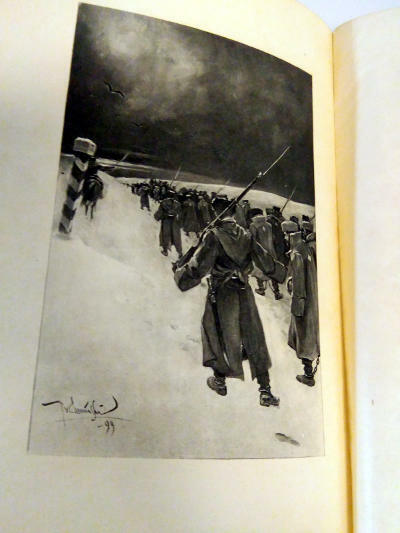 The novella was published in 1889, and was promptly censored by the Russian authorities. The work is an argument for the ideal of sexual abstinence and an in-depth first-person description of jealous rage. The main character, Pozdnyshev, relates the events leading up to his killing his wife: in his analysis, the root causes for the deed were the “animal excesses” and “swinish connection” governing the relation between the sexes. Count Lev Nikolayevich Tolstoy also known as Leo Tolstoy, was a Russian writer who primarily wrote novels and short stories. Tolstoy was a master of realistic fiction and is widely considered one of the world’s greatest novelists. He is best known for two long novels, War and Peace (1869) and Anna Karenina (1877). 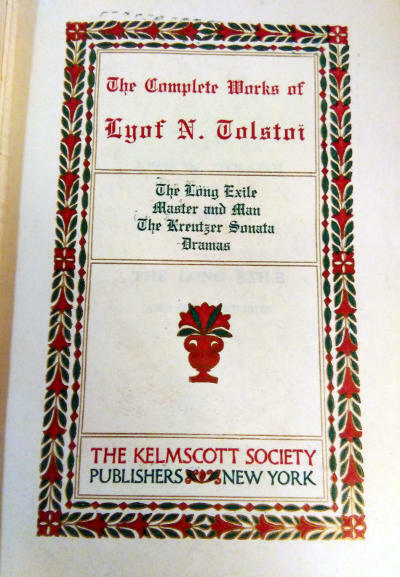 Tolstoy first achieved literary acclaim in his 20s with his semi-autobiographical trilogy of novels, Childhood, Boyhood, and Youth (1852-1856) and Sevastopol Sketches (1855), based on his experiences in the Crimean War. His fiction output also includes two additional novels, dozens of short stories, and several famous novellas, including The Death of Ivan Ilych, Family Happiness, and Hadji Murad. Later in life, he also wrote plays and essays. Tolstoy is equally known for his complicated and paradoxical persona and for his extreme moralistic and ascetic views, which he adopted after a moral crisis and spiritual awakening in the 1870s, after which he also became noted as a moral thinker and social reformer.